Hey everyone, it's a surprise to me that I'm even making this post but here I am! Today I'll be giving my thoughts on the whole Sailor Moon Crystal portion, thus far, of the Sailor Moon franchise. I never thought I'd bother with Crystal given in my last Sailor Moon post I've said, "..even from not watching Crystal, I already know it's probably a huge letdown based on the negative feedback a lot of people are giving." Well, things have changed and I just recently watched Crystal.. thanks to a friend of mine! In my last post I sort of suppressed my "love" for Sailor Moon, but I don't mind making it clear that it's one of my favourite anime. Sailor Moon was a integral part of my childhood growing up, I rewatched the original series to Super S in English dub back in middle school, and eventually embellished in Stars sometime during high school. Neither one of the five original installments of Sailor Moon disappointed me but I do have my favourites over others. Having said that when Sailor Moon Crystal was announced in 2012, I was excited that there was going to be new Sailor Moon content. When they pushed the project back, I was weary that Crystal would even come to fruition... but it eventually did! Once I saw the trailer of Crystal, I was underwhelmed, and disappointed simply off of a trailer. I had high hopes for Crystal and the trailer pushed me away from watching it. And when episodes were released every two to three weeks, I felt like it was a sign that Crystal wasn't for me since I usually binge anime after they finished airing. By the time Crystal 1 and 2 finished, I kind of forgot about contemplating if I want to watch it or not. But I eventually did watch Crystal not to long ago (clearly since I'm writing about it). Anyways here are my thoughts on Crystal..! Let's talk about the neon pink elephant in the room... the animation. Yes, the animation was horrendous for Crystal 1/2 when you compare it to the quality of animation by 2014 standards, I can't argue with you there. Even though it's an ONA, there should be no excuse as to why the animation wasn't as good. There were so many mistakes in Crystal 1/2 that were laughable, confusing, unappealing, etc... The announcement of new Sailor Moon content was enough to energize the Sailor Moon fanbase, and what we got in return in terms of animation was a bit of a letdown. Don't get me wrong there were some beautiful shots in Crystal 1/2, but a good chuck of the animation was cringeworthy. 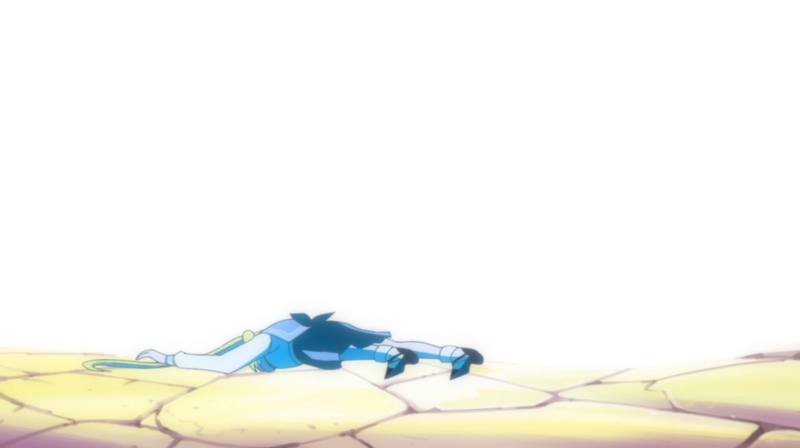 When you look at scenes like this and this... it's like Toei... pls. Having said all of that, I personally think that you shouldn't base the Crystal series solely on the animation because having that kind of mindset only shrouds everything else that's offered in Crystal 1 and 2. I really enjoyed the story in Crystal 1/2, the animation just pulled back my enjoyment just a bit... ok fine not a bit maybe a small chunk. But even so, knowing that the manga was coming to life was a small thread to of hope to hold on too. By Crystal 3, I think Toei got the message and upgraded the fluidity of the animation and character designs. Animation in Crystal 3 was far, far better than Crystal 1/2, it was phenomenal to be exact. The upgrade in animation was a much welcomed change in Crystal 3, and to my disappointment Toei proved to us what we could have had from the beginning! Here are a few of my favourite stills from Crystal 3: upgrade 1, upgrade 2, upgrade 3, upgrade ∞. This sort of goes hand in hand with the animation but whatever. Transformations was an important core to the Sailor Moon franchise, it's the essence of any magical girl anime. For those who've been following Sailor Moon since the 90s- the transformations of all the senshi brought back an ample of nostalgia. However to be quite frank, the animation for the transformations in Crystal 1/2 weren't as great as I wanted it to be. I don't have an issue with CGI being used since anime like Sidonia no Kishi and Ajin, done by Polygon Pictures, were done pretty well with CGI. However the quality of the CGI henshin was subpar and took a bit of the that excitement factor out of the henshin portions of Crystal 1/2. I mean... the 3D henshin of every senshi all kind of looked like strings of udon waving through the air. It looked unique, it's not bad yet it's still kind of decent. In Crystal 3, CGI is completely gone and we're left with stunningly beautiful transformations of all the sailor senshi. I was smiling ear to ear when I saw how beautiful they were, big improvement from Crystal 1/2 and the 90s. 2D transformations were much better than the CGI alternatives, and I wish they just stuck with the 2D henshin rather than the 3D from the get go. Sailor Moon Crystal follows the source material much closer than the original series did and each arc was 13 episodes long. Compared to the original where each season was around 40 episodes long and not as close to the source material. 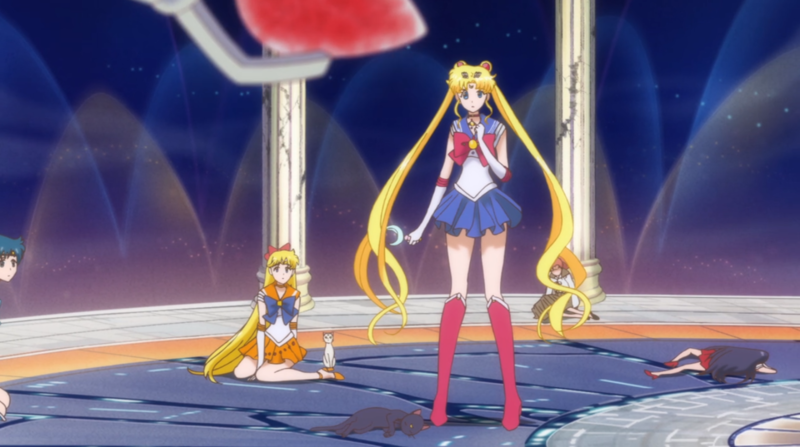 The point is that with the time constraints Sailor Moon Crystal had, somethings were compromised. If you've been watching Sailor Moon since the 90s, then it's noticeable that the balance between storylines, the charm of the anime, and characterization were shifted in Crystal. Crystal followed the manga more whereas the original didn't as much. In the original you had a good balance between charm, development between the senshi and story; whereas in Crystal the balance tilts more towards the story and you lose some of the charm and characterization between the characters. In Crystal, other than the episodes where they introduce the each senshi, there isn't much personal interaction between the characters beyond that point when you compare it to the original series. I'm not saying it's a bad thing that it's a bit different in Crystal, but given that each arc was 13 episodes it's just that this aspect isn't the same as it used to be given the 13 episode time constraint. The original had about 40 episodes per season and in Crystal you have about 13 episodes per arc. 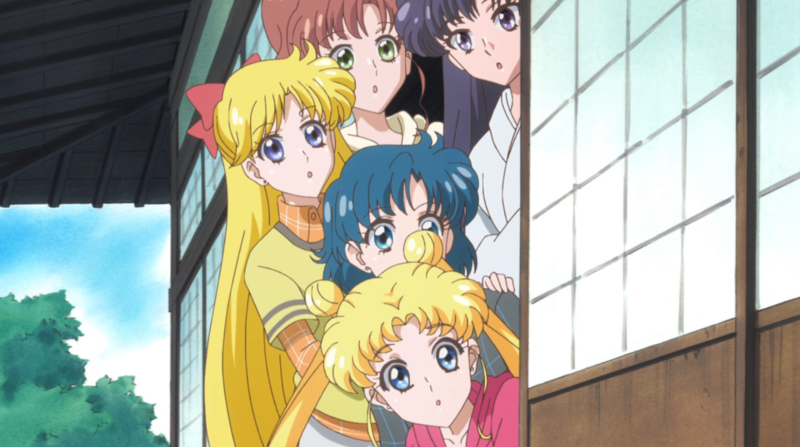 A 40 episode format provided more time to allow people to fall in love with the story, the chemistry between the characters, and everything else Sailor Moon had to offer. Whereas Crystal stayed true to the manga and had less time to create this lure. Some people were just dying for that original banter between the characters that the original Sailor Moon had, which was watered down in Crystal unfortunately. I thought that the story in Crystal made up for that loss since I kind of feel like the story in Crystal was much better than the 90s. The 90s adaptation was a bit redundant with the majority of the episodes were the senshi fending of the minor villains until the last few episodes where they went after the "major villains." It's not really like this in Crystal. In Crystal you get an awesome storyline you can follow, and it's much less redundant. Crystal may have been fast in terms of the speed of the plot, but that's just how it was! 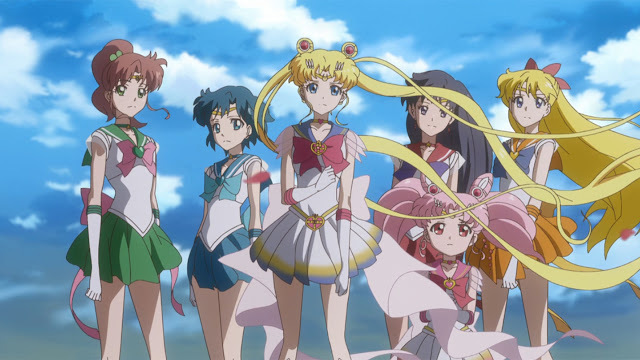 My main complaint is that the first arc of Sailor Moon Crystal was a bit bland, when it really shouldn't have since the inner senshi were introduced, most of this was sadly attributed to the poor animation. It wasn't until the second arc that the story really took off, despite the lackluster animation. And from Crystal 3 it only got exponentially better. Although the charm of Sailor Moon Crystal was compromised to a small degree, the storyline in Crystal made up for it. Not saying the fun/charm isn't there in Crystal, the charm is still there just not as big and in your face as it was in the original. You could hate Crystal or love it but one thing most people who've seen Crystal can agree on was that the OST was great! Dare I say it... but I think the OST for Crystal 3 in particular was better than the OST for... Aria. Shocking. And if you know me, then you know that the Aria OST is my all time favourite. Crystal's OST is just that good, it's actually heaven to your ears. You shouldn't compare Sailor Moon from the 90s to Crystal, though I understand it's only natural. It's funny I say that since the whole post up until now I've been comparing. But it's true, and it's the web I got caught in which originally stopped me from watching Crystal or enjoying it as much as I could. The 90s was the 90s and Crystal is Crystal, they're two separate things. You shouldn't put your eggs in one basket and assume 90s Sailor Moon would have transferred into Crystal because Crystal is more story based and the original wasn't as much in comparison. Between the 90s version and Crystal there were different transcripts, and different angles in which the plots played out and the only thing that was the same was the characters themselves. If you stop comparing then you might actually enjoy Crystal! If you want some consistency from start to finish the original did just that. If you're open to the idea that Crystal starts off extremely weak but continues to improve it's story and animation from arc to arc, then watch Crystal. If you're a 90s super-fan and have your walls up, then don't bother with Crystal since it's just not worth having that type of mindset watching this series. It's like people who saw the original series who go on to watch Crystal are holding their breath waiting for the aspects from the 90s to magically appear; sorry to burst your bubble but don't count on it... 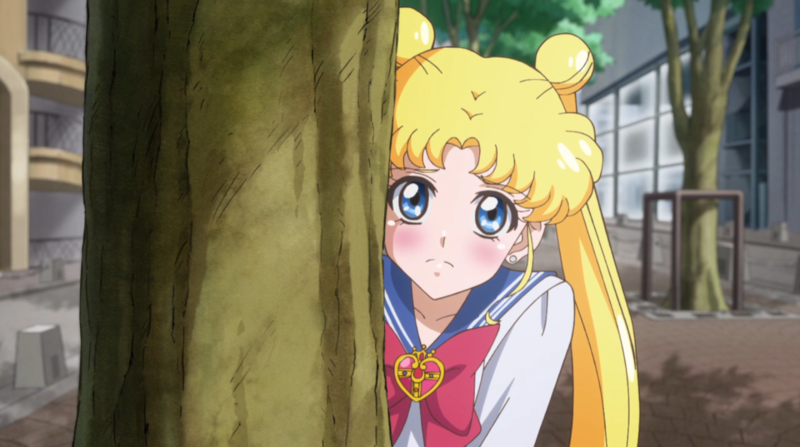 Sailor Moon Crystal isn't a remastered version of Sailor Moon. These are just my opinions, you could have opinions on Crystal that are the complete opposite of mines and that's fine. Not everyone has to enjoy Sailor Moon. There were a lot of mixed emotions for Crystal 1/2, most of which I think derived from the animation. But I look at it like this where if you focus only on Sailor Moon Crystal's plot, it delivered a promising adaptation of the manga. It's just that how the manga was brought to life left many in the dust when they saw Crystal 1/2. So I feel as though a lot of people couldn't brush off the animation and look at everything else Crystal had to offer. Those who've watched Sailor Moon since the 90s should watch Crystal with an open mind and hopefully see that it gets better by the episode. Noting that Crystal 3 was a major upgrade from the first two arcs in every aspect that Crystal 1/2 had to offer. And to those who've never seen the original Sailor Moon and find distaste to Crystal, I say keep an open mind as well! Or be the keyboard warrior you were meant to be and spew the hate you have for Crystal... I'm joking don't do that. Sailor Moon Crystal 3 was simply amazing and spectacular compared to Sailor Moon Crystal 1/2. 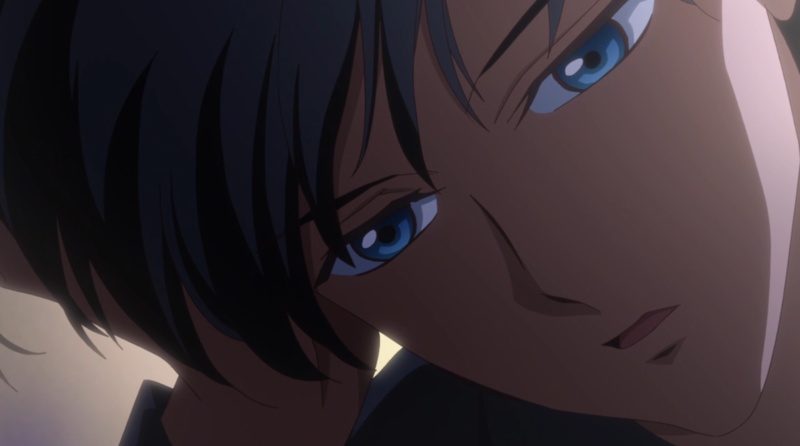 I just wished that those who dropped Sailor Moon Crystal after the first or second arc knew that a third arc actually exists, and if they already knew it exists, I wish they knew that it was done so magnificently well when compared to the first two arcs. In the end, I shouldn't have listened to others or judged Crystal based on a two minute trailer, special thanks to my friend who pulled me back in to Crystal! Throughout this post I guess you could infer that I didn't like Crystal as much, but that's not the case. Crystal 1/2 had a bumpy start but finished on a somewhat high note, and Crystal 3 was just pure gold to me from start to finish. I ended up liking Crystal a lot more than I expected, so what can I say? There were amazing, nostalgic, emotional and funny moments that Crystal had to offer. I'm happy someone convinced me to watch it since Crystal was a rollercoaster of many positive emotions...haha. Fingers crossed for a Crystal 4! Anywhoooo... this is probably the longest post I've ever made on my blog... since I love Sailor Moon that much hehe. My thoughts are pretty much scattered all over the place, so I'll stop! And if you've read up to here... thanks! Leave a comment below if you can since I'd like to hear your thoughts on Crystal! You made a post with lots of text. yea, its somewhat difficult to get into since there's so much anime out there. It was extremely popular in the 90s and early 2000s.